1.Prepare outdoor grill with half for direct grilling over medium-high heat and half for indirect grilling. Place sausage in large zip-top plastic bag. Place mushrooms, bell peppers and onion in separate large zip-top plastic bag. Pour 1/2 cup dressing into each bag; seal bags, pressing out excess air. Refrigerate 15 minutes. 2.Meanwhile, soak skewers (if using bamboo) in water 15 minutes. In small bowl, whisk mayonnaise and pesto until combined. Cover and refrigerate until ready to serve. Makes about 1 cup. 3.Remove sausage and vegetables from marinade; discard marinade. Alternately thread sausage, mushrooms, bell peppers and onion onto skewers. Sprinkle kabobs with salt and pepper. Place kabobs on hot grill rack over direct heat; cook, uncovered, 8 minutes, rotating kabobs a quarter turn every 2 minutes. 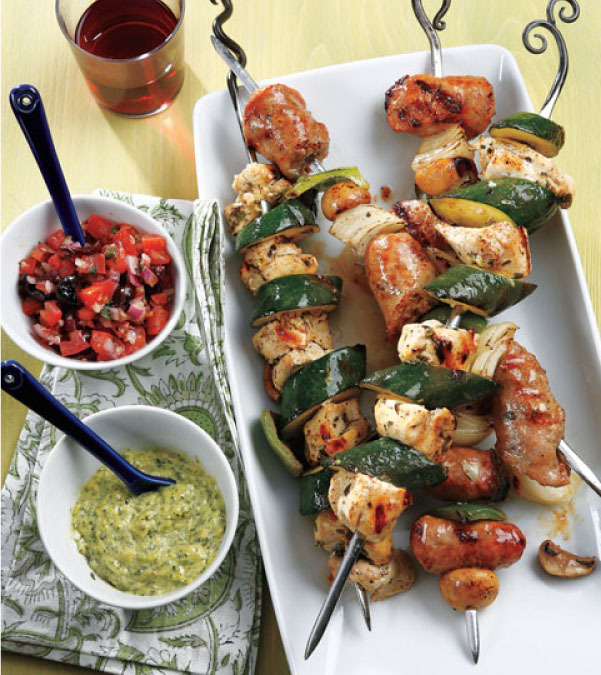 4.Transfer kabobs to indirect heat; cook, covered, 12 to 16 minutes longer or until internal temperature of sausage reaches 160°, basting occasionally with remaining 1/2 cup dressing and rotating kabobs a quarter turn every 3 to 4 minutes. Serve kabobs with mayonnaise mixture.